Copyright troll Righthaven LLC just doesn’t know when to stay down. Faced with six district court judges determining it didn't have the right to sue people over copyrights it didn't own, it turned to a higher power: the Ninth Circuit Court of Appeals. Yesterday, EFF appeared before that court to argue (audio) against Righthaven on behalf of Tad DiBiase, a criminal justice blogger who provides resources for difficult-to-prosecute "no body" murder cases and was one of Righthaven’s victims. The leading issue on appeal was whether a newspaper could transfer the right to sue for copyright infringement to a copyright troll, while retaining all other rights in the newspaper articles. Under the Copyright Act, only the "owner of an exclusive right under a copyright is entitled ... to institute an action for any infringement of that particular right committed while he or she is the owner of it." In a previous case, the Ninth Circuit explained that the "Copyright Act does not permit copyright holders to choose third parties to bring suits on their behalf." Nevertheless, Righthaven insisted that it was entitled to sue because it claimed ownership of the copyright for an instant, before immediately returning the rights to the newspaper publisher. A secret agreement between Righthaven and Stephens Media ensured that the publisher retained all of the rights to exploit the news articles. During the hearing, the three judges on the appeals court panel appeared quite skeptical of that theory, suggesting that Righthaven seemed to want them to put "form over substance." Judge Clifton called Righthaven's legal approach "too cute by half," adding "at the end of the day, I don't see how Righthaven has the rights under the Copyright Act to do anything." The panel, consisting of Judges O’Scannlain, Trott and Clifton, took the matter under submission, and will likely issue a decision in the next few months. In this case, Righthaven’s victim was Mr. DiBiase, an attorney who consults with law enforcement across the country on "no body" cases -- where the victim is missing and presumed dead, but no body has been found. Mr. DiBiase runs a non-commercial website at www.nobodycases.com to gather information on these complex investigations in order to help other prosecutors as well as family and friends of "no body" murder victims. Even if Righthaven had the right to sue, Mr. DiBiase made a fair use of the the newspaper article. The federal district court determined that Righthaven did not own the copyright after examining the secret agreement between Righthaven and Stephens Media. As we explained to the court, the purported copyright assignment was a sham. Soon, Righthaven was losing case after case for lack of ownership, and its business model collapsed. In the appeal, Righthaven was represented by a new attorney, Erik Syverson of Miller Barondess. Its CEO and founder, Steven A. Gibson now an attorney with Dickinson Wright, was in the audience. EFF, Colleen Bal and Evan Stern from the law firm of Wilson Sonsini Goodrich & Rosati, and Las Vegas attorney Chad Bowers represent Mr. DiBiase. The appeal was consolidated with Righthaven v. Hoehn. 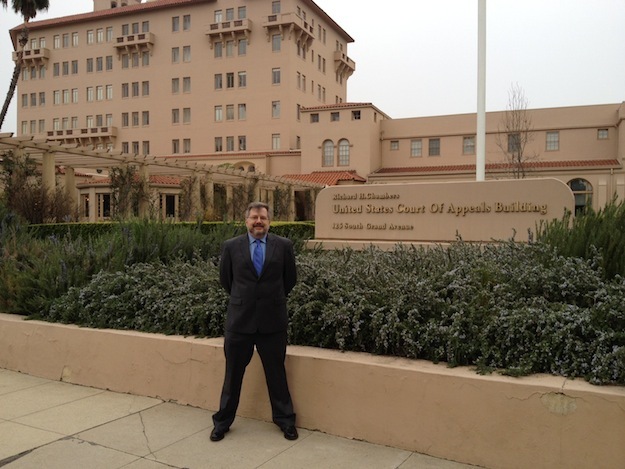 Mr. Hoehn is represented by Marc Randazza and Jay DeVoy of the Randazza Legal Group.